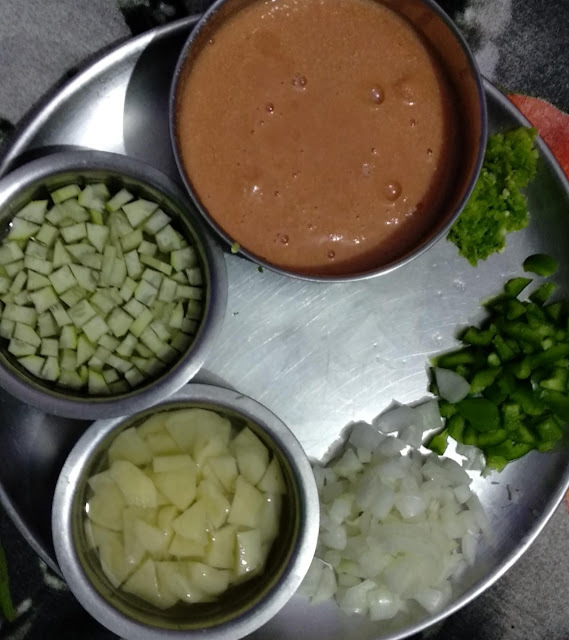 A blog about Indian vegetarian meals, healthy snacks, Innovative food, continental food, yummy lunch,dinner, break fast recipes, beauty and fashion. Almost all age group are fond of kadhi chawal. Kadhi is a very popular Indian dish, which is prepared in different ways in different regions. In Gujarat, people prefer a kadhi without red chili and little sweet taste. 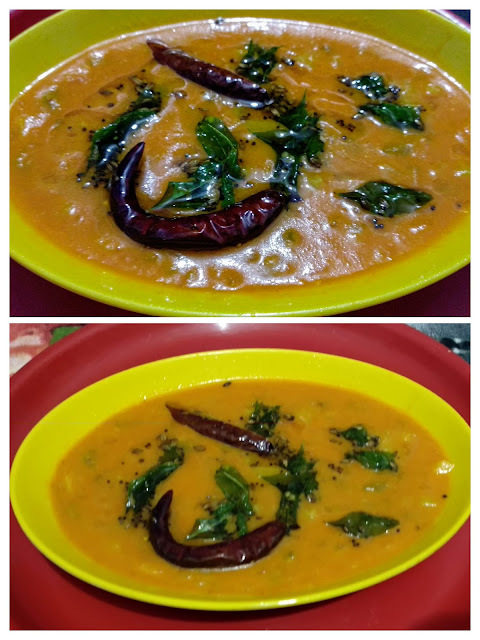 Punjabi and Rajasthani people prepare kadhi with spicy red chili and also pakora kadhi. Sindhi people prepare kadhi with tamarind, instead of buttermilk. Buttermilk and tamarind both are sour in taste and many people are allergic to sour things. I am also one of them, but I love kadhi, so tried this kadhi made from salad tomatoes, which are not sour in taste. It came out so yummy, just try it and you will experience the aromatic taste. So let us start. Recipe Instructions : Boil the tomatoes in water for 2-3 minutes, let them cool. Make a paste of garlic,ginger and green chili in a grinder. Remove the skin of tomatoes and blend them to a smooth paste along with 2 tea spoon chickpea flour ( besan ). Heat 1 tbsp refined oil in a pan, add onions, saute for 2 minutes. Add ginger garlic paste and saute for 2 more minutes. Add capsicum, saute for 2 minutes. Add all the spices, along with salt to taste, mix well. 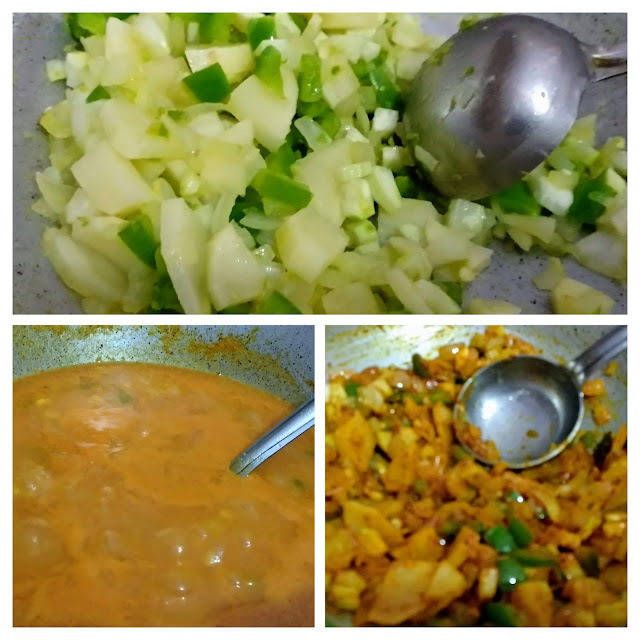 Add potatoes and bottle gourd and mix well. Add tomato puree mix well. Add 3 cups water and cook on medium flame continuously stirring. When it comes to boil, low down the flame and cook for 20-25 minutes stirring occasionally. Now heat 1 tbsp cow ghee in a tadka pan. Add cumin seeds and mustard seeds, turn off the flame. 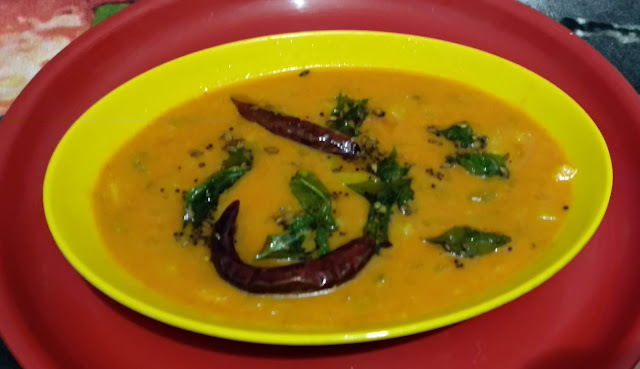 Remove from gas, wait for few seconds, then add dry red chili , asaofetida and curry leaves and pour the tadka on kadhi. Awesome Tomato vegetable kadhi is ready. 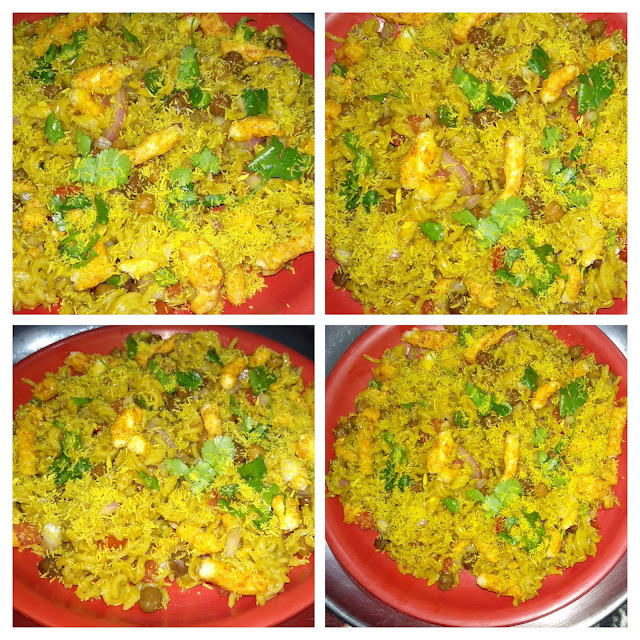 Serve with rice, pulao, roti or paratha. Note : You can add any vegetables of your choice. In winters, peas, french beans, carrot are available, you can add them to add full nutrition to the dish. I am Sandhya, face behind Indian vegetarian Recipes spot. I love cooking and trying new innovative and healthy dishes. Welcome to my world of recipes.